Part 1 we dealt with resistance to change, today we will learn how to manage the transitions or changes in our lives, how do we face the rabbit hole with courage? Acceptance: Yes, acceptance is a choice—a hard one most definitely and one of the most important ways of dealing with change because through acceptance every other way of managing change flows…. In the end it’s a choice that only we can make at any given situation of our lives. when we learn to accept things as they are we open the door to inner peace we stop resisting what is happening to us, and then our mind can be open to the changes that is happening in our lives … In the process of accepting we should always ask ourselves this question, “ have I done all I humanly can? If the answer is yes then it’s now out of our control… the next step is to accept what life is presenting to us and let go and let God/universe. Acceptance, in my opinion, is the key to convert momentary happiness to enduring happiness; it is like protecting ourselves with our own shield. Non Attachment to outcome: When you attach yourself to the outcome of anything be it a project, your goals, you will find it hard to manage changes in your life because you think things should happen a certain way in your own time table …and you know what our timetable is like…everything going from A to B then C straight forward but life has its own way of bringing about your dreams… like a game of snake and ladders.. Obstacles, changes, doors closing, people dying or leaving us…. These take us to Z before going to B… others are redundancy or sacked from your job before starting that business you always dreamed of… life is one big mystery and we never have the answers, so you should just trust that whatever is showing up is what is needed for your growth and stop attaching yourself to your outcomes and your own man made map /GPS so you don’t set yourself up for disappointments… you should try and enjoy the moments be in the present don’t see it as a means to the outcome we want. Change your perception towards the change: Change can definitely cause disruption in your life. If you have chosen to make the change, then you probably feel more in control of the situation. If the change is occurring without your consent, then you need immediately to make certain that this transition does not take control of your decisions. When change happens in your life, react by being excited, stimulated and inspired—not threatened, terrified or immobilized. Look after your body health: Change causes stress, and stress can be detrimental to your health. So whether you think you have the energy or not, take positive action. Start moving physically, and do not allow yourself to become complacent. Get 6 to 8 hours of sleep regardless of whether you want it; eat well—regardless of whether you feel like it; exercise every day to burn off some of the stress and get the bodies happy pill endorphins, and drink more water to flush out the impurities caused by toxic stress levels. When you handle change in your life, taking care of your physical body often is neglected. Keep moving—you’ll feel better—even in tough times. Build Relationships and Network: Change can lead you to meet new and inspiring, helpful people, or it can lead you toward isolation. How you handle change in your life can cause you to become afraid and turn inward, not wanting to share your fears, sadness, or anxieties with others. But during life transitions, change is easiest when you let others help. Build a network of support. Surround yourself with a team of 2-3 people who will keep you moving on your forward path to success. Stop burying your head in the sand: Be prepared if is sickness read about it, if you are hearing whispers of redundancy at work start preparing your CV, start looking for other options.. If your business needs a face lift or you are starting a new business do your research and be prepared for the change ask other business owners how they coped from the transition of being employed to self-employed… remember grass is always greener until we get nearer… Always ask yourself what’s the worse that can happen: will I loose my job, will I be uncomfortable if he leaves me or I start all over… If it does not kill me it will make me stronger. Regardless of the changes you are experiencing, life is worth living. So, go out and embrace life. Make life an adventure worth exploring. in this article i will highlight reasons why we humans hate going down the rabbit hole. Change scares us—probably even more than our worst phobias, because we are not in control but it’s an issue that we don’t think about because it manifests itself subtly in so many ways. Whether a relationship starts or ends, you’re moving, you’ve got a new job, or you’ve lost someone you love, change—whether it’s good or bad—causes stress. Like walking down the street taking a familiar path we feel more in control but once we take a new path our brains start sending funny signals like running into a roadblock, suddenly information we trusted has broken down. We say to ourselves: Where does the other road lead? How long will it take? Is it dangerous? What we don’t know tends to scare us, and change creates a lot of things we don’t know. As a result, we tend to act pretty irrationally to try and prevent change, often without realizing it, and make our lives unnecessarily problematic. People that are closed minded find it very difficult to accept change, they are not open to new ideas or new ways of seeing things, they belief their way or old belief system is the only and right way and anything on the contrary will make them resist change. An example in a work environment where change needs to be introduced by management some employees seem to have a close mind attitude by not wanting to be confused with any new facts or supporting documents about the change even if you try to let people in this school of thought see a better tomorrow… Their minds are fully made up. Fear of the unknown (down the rabbit hole): We’ve all heard of the old proverb, “The Devil you know is better than the one you don’t”. This great fear of the unknown causes people not to take chances and to stay in situations where they’re not very happy….. You tell yourself the “grass is greener” and bury any thoughts of changing your situation for the better. You think you should stay where you are, just in case. You don’t have a crystal ball to predict the future so you can’t tell for sure what the consequences of your actions will be. You do know what you have now and you tell yourself that if you think about it, it’s really not that bad. Right? The fear of the unknown is what stops most people going down the rabbit hole and not making positive changes in their lives. If you let it, your imagination can dream up a never ending supply of terrible things that could happen. Doing things in the same routine, predictable manner is comfortable. Asking people to change the way they operate or think is asking them to move outside their comfort zone. “We’ve always done it this way, so why do we need to change?” becomes the rallying cry for people who have difficulty changing their routines. In some cases, people may ignore or deny the change simply because it requires them to experience something beyond their normal way of life. We are normally hesitant or unwilling to try anything new because we are so set in our ways as a result it impedes our personal growth, development and adaptation to change. Instead of using it as an opportunity of life to live well we put ourselves in a cage and live a stagnant mediocre life. when contemplating change we tend to focus on external things to define our identity and worth (what kind of job we do, what kind of possessions we have, how much we make). We put an emotional weight on stuff like this. If we don’t have the latest gadget, car or live in a certain location, we feel like a failure. We can’t take the risk of losing all our possessions. It’s who we are. People always ask us, “what do you do?” When we answer, our job seems to be a huge part of our identity. Change freaks us out because it threatens to expose our weaknesses and our vulnerabilities. 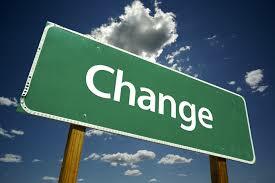 part 2 of this series will find ways to manage and accept change.